There wasn't a single tornado that caused extreme damage -- for the first time since records began being kept (1950). That type of tornado is defined as EF-4 and EF-5 intensity on the Fujita intensity scale. Even better: the trend in this type of tornado is down. And, 99 other great things are here. ADDITION: I was not aware of this (posted 1:27pm CST). If we can get through the day (there is a tornado watch in effect as I write this) without a tornado death, and I think we can, this is quite an accomplishment for weather science. The tornado warning system is a Nobel Prize-worthy endeavor. to emergency managers across our nation! Yesterday, I finished reading The Man Who Caught the Storm by Brantley Hargrove. Here is a brief review. My rating? 5 Stars. The book begins a little slowly but picks up quickly and turns into a compelling read. 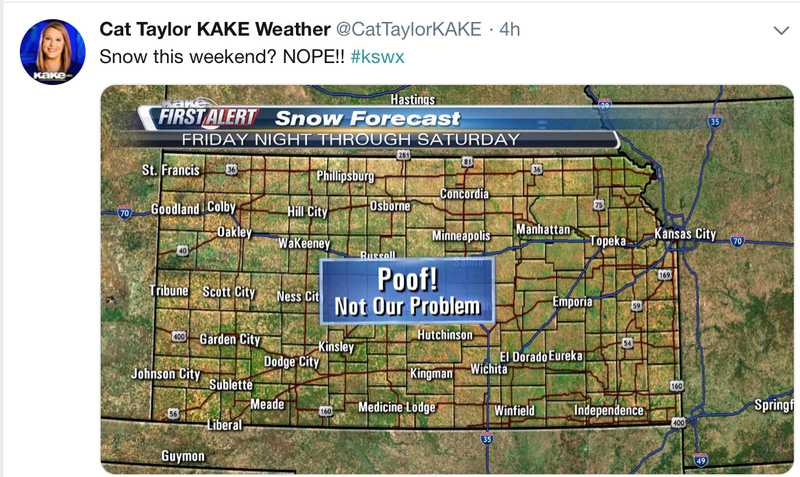 As a meteorologist and storm chaser, I was impressed by the thorough research and scientific accuracy. It is very refreshing to read a book of this nature and find it to be accurate. 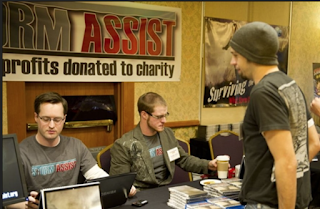 While I knew of Tim, I did not know him personally other than to say hello at a couple of conferences. That stipulated, this portrait of the man and his work ring true. 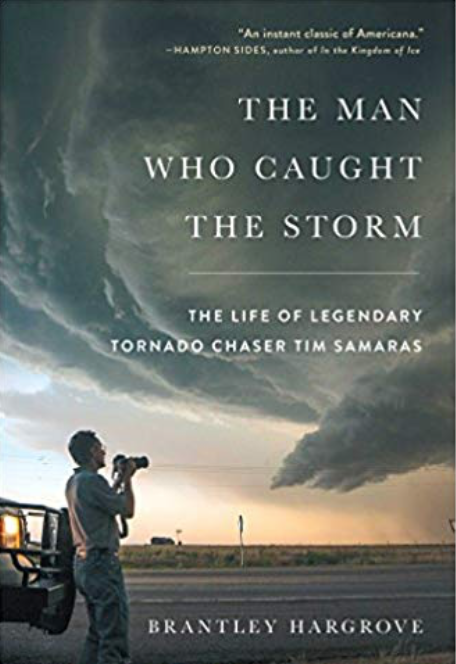 I believe this book will be interesting to all who might be interested in the story of an outstanding scientist who pushed the envelope too far and became the first storm chaser (along with his son and a friend) to be killed by a tornado. 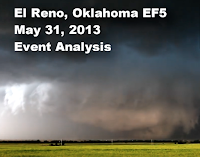 The only concern I have is whether a reader who is not a weather aficionado will be able to completely follow the chapters regarding his last storm chase, which involved the El Reno (Oklahoma) Tornado in 2013. 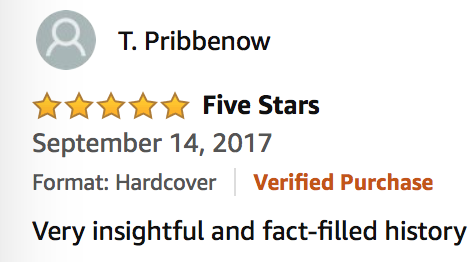 The reader reviews at Amazon do not point to a problem in that regard. 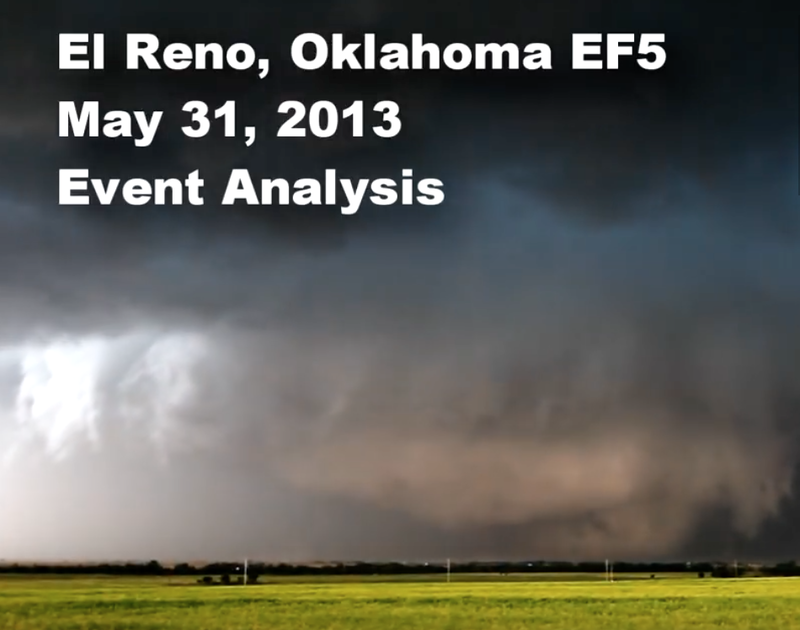 However, if you are interested, there is a video forensic analysis of the El Reno Tornado here. Especially helpful in the analysis is the movement of Tim's car in relation to the location and path of the tornado. That leads me to the only thing I didn't like about the book: the omission of photos. They would have been appreciated, especially since the text specifically mentions photographs on a number of occasions. 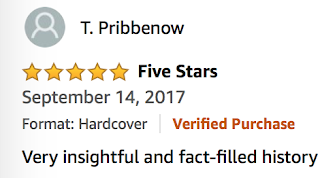 The book is so well written that I have kept the rating at 5 Stars but I did consider grading it down due to the lack of both photography and illustrations. Note: If you search around the internet for more information on this terrible event, you will undoubtedly come across this National Geographic Special. While it is better produced than the above, it has several scientific inaccuracies and cheesy sound effects. 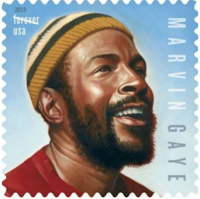 I was pleased to learn this morning the USPS is going to issue a Marvin Gaye stamp in 2019. 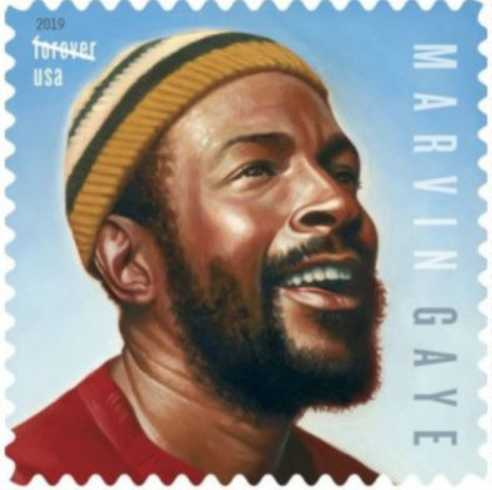 The late Motown singer was one of my favorite signers. The date of issue has not been released. A hero has passed away. Joe Audsley, the hero of the Ruskin-Heights Tornado, passed away on Christmas. It was Joe, along with his (late) partner, Bob Babb, who issued the Weather Bureau's first modern-day tornado warning. It was credited with saving scores of lives in the 1957 Ruskin Heights Tornado. 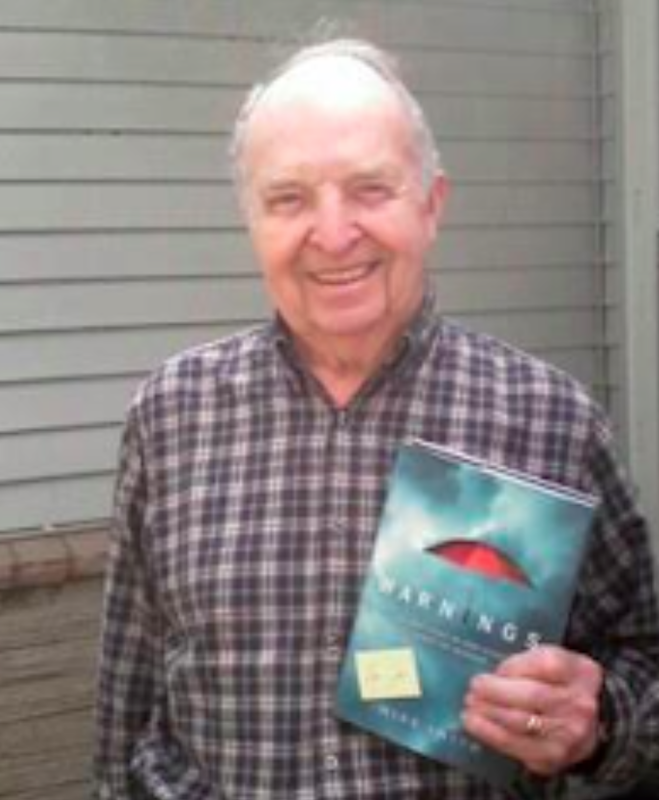 I tell his story in Warnings (pictured above in 2010 with an autographed copy). When Joe issued that landmark warning, the Weather Bureau was not in the tornado warning business. 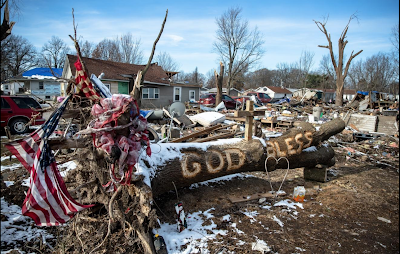 Since then, the (now) National Weather Service's tornado warnings have saved tens of thousands of lives and the death rate from tornadoes has been cut by 95%! But on that May, 1957, evening, Joe and Bob thought they would be fired the next day. 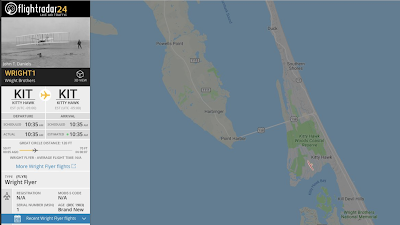 I first got acquainted with Joe when my Grandmother took me to visit the Weather Bureau office at what is now called the Charles Wheeler Airport (then, Municipal Airport) in downtown Kansas City. Joe eventually moved to the National Weather Service Technical Training Center in east KC where I got to know him again when I was in high school. He was always encouraging and upbeat to this aspiring young meteorologist who wanted to learn about tornado warnings from him. 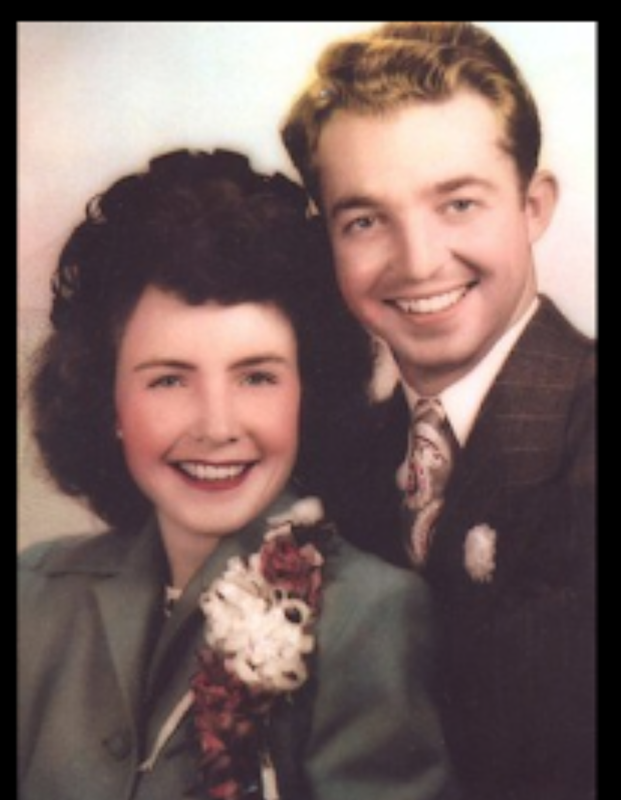 Joe was married for 65 years to his wife, Lee, and I've always loved the photo of them on their wedding day. Lee passed away in 2011. Joe was not only the hero of the Ruskin Heights Tornado, he was the Navy meteorologist during World War II battles of Iwo Jima and Okinawa. There will be a visitation from 2 to 4pm Sunday at Terrace Park Funeral Home at 801 NW 108th Street (just off Highway 169 between Interstate 435 and Highway 152) in north Kansas City. He will be buried in his home town of DeWitt, Missouri, Monday. Joe is one of those people of whom you say, "That was a life well-lived." Rest in Peace, Joe. Glad you made it to Heaven in time for this year's big celebration. 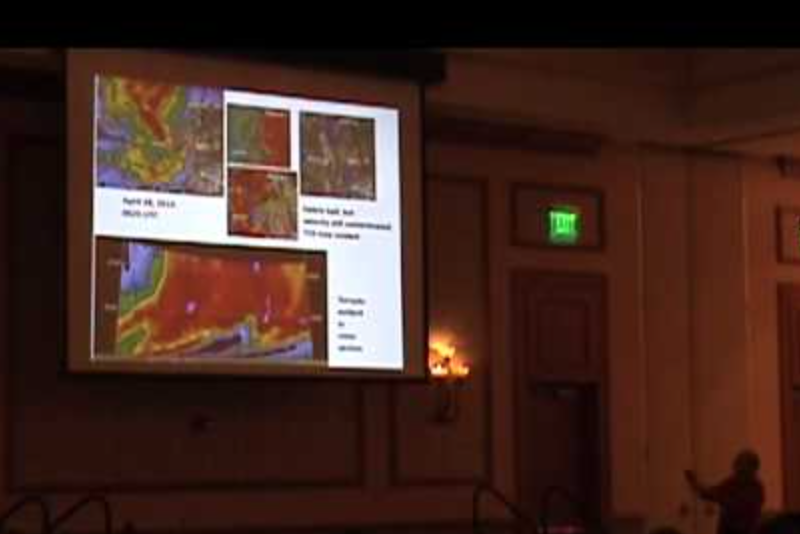 As previously mentioned, ChaserCon -- the largest gathering of storm chasers, meteorologists specializing in tornadoes and severe storms, and weather aficionados -- will be coming to Wichita February 8-10. The Wichita Eagle has more here. It is now time to start signing up and you can easily do that here. The public is invited. The event will be of special interest to emergency managers and first responders both in terms of the presentations and sponsors' booths. I am going to be the keynote speaker Saturday evening and I'm really looking forward to it. I have a very special presentation I believe everyone will greatly enjoy. Perfect Use For Your Amazon or Other Gift Card! "You Will Love This Book"
Warnings is written in the style of a novel and is packed with exciting, uplifting stories. Remember: a great hardcover book is highly portable and always charged. It is the perfect way to use that Christmas gift card. Click here to go to Warnings' site at Amazon. greetings to all of our customers and readers. 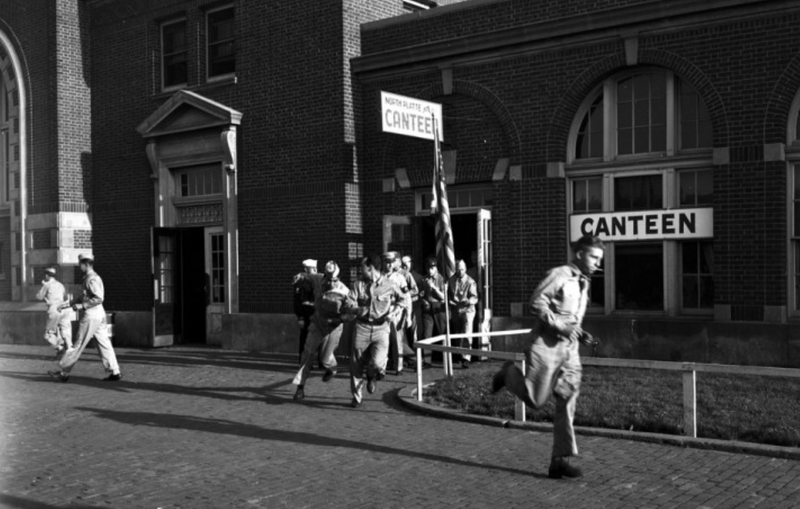 It was on this date on 1941 the North Platte Canteen opened to serve railroad passengers during World War II. 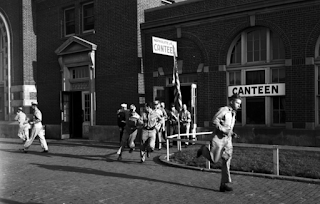 If you received a gift card from Santa, and you've already read my book, then I recommend Bob Greene's The Miracle of the North Platte Canteen. Christmas Eve, 1968, witnessed one of the most amazing things in history: Apollo Eight orbited the moon while Frank Borman, Jim Lovell and Bill Anders conducted a live broadcast. While the image of the moon's surface was extremely grainy, everyone watching was transfixed that it was occurring at all: live television from the moon! It was just six years earlier that technology allowed worldwide broadcasts on earth. The lunar commentary would have been spectacular enough. Then, without advance fanfare, the astronauts began reading from the Book of Genesis and it was stunning. All seven of us in our family watching the television were uplifted by those 6,000 year-old words. the reading of the Bible from the Moon may not have seemed so extraordinary. Yet it was. Fifty years ago tonight. What a Christmas gift to the Earth! 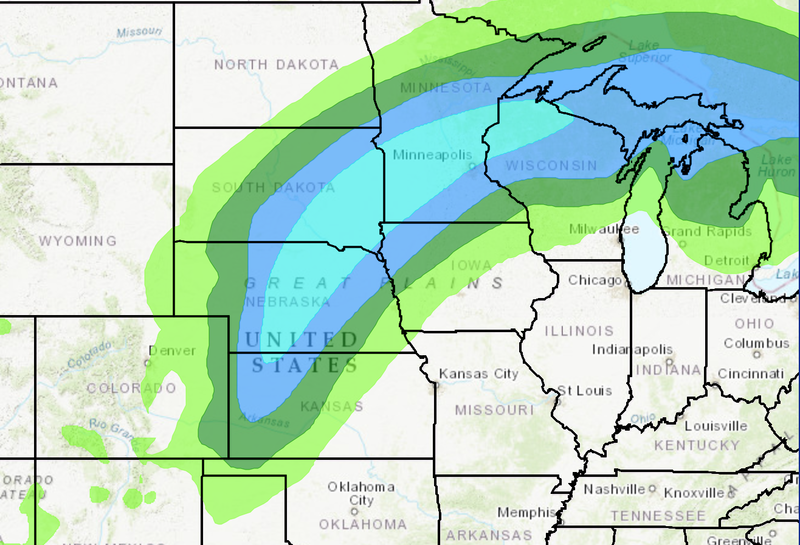 A winter storm may move out of the Rockies Tuesday and onto the Great Plains and Midwest Wednesday and Thursday. The maps below are preliminary forecasts of 3" or more of snow. You may want to keep this in mind as you plan your travel for the post-Christmas period. 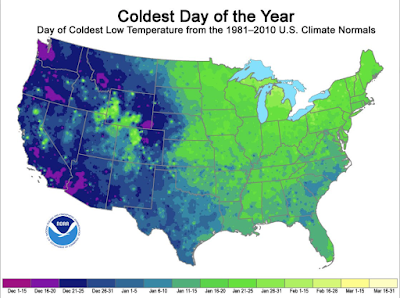 Statistically, When Is the Coldest Day of the Year? 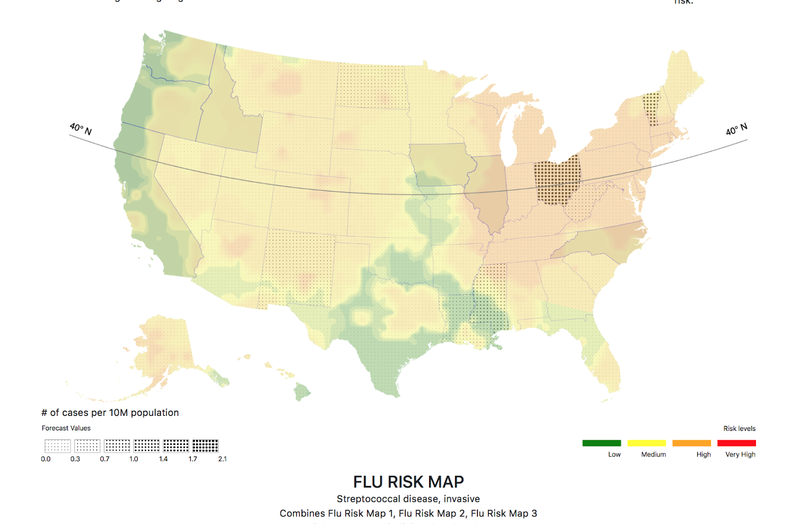 Per this morning's Diseasecast, clicking on the Flu Map will reveal a rapidly increasing risk of influenza over the next one to two weeks. This is especially serious in the Ohio Valley and Middle Atlantic region with the State of Ohio especially at risk. I believe so much in the new science of proactive health forecasting that I am an investor in Ascel Bio (for full disclosure) which produces the Diseasecast forecasts. With all of the holiday parties this weekend and with New Year's Eve coming up, I urge you to practice good hygiene. Wash your hands, cover your mouth, et cetera. 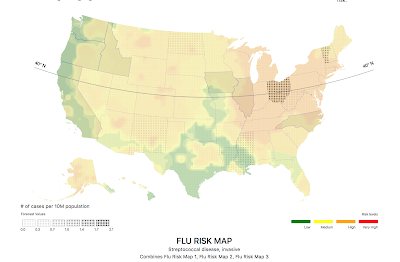 Ascel Bio's experts have picked best-in-class products for flu prevention in the "Shop Now" area. Click on on it and it will take to your Amazon account. Finally, there are great blogs on keeping healthy. Want to keep your family healthy? I encourage you to add Diseasecast to your arsenal of health tools. A meteotsunami is a rare rapid rise in water level caused by barometric pressure changes associated with a squall line. One occurred yesterday in Florida and it is the most pronounced I have seen. 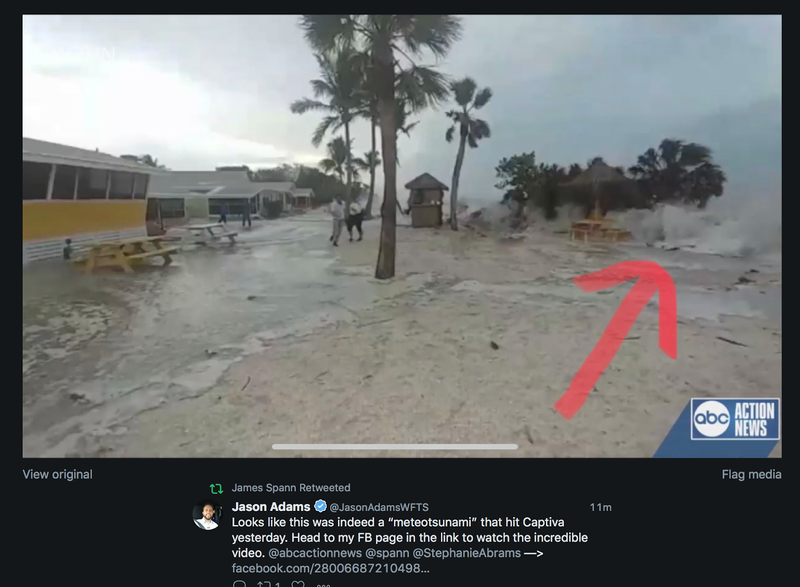 I don't know how to embed Facebook video, so click here. Remember: a great hardcover book is highly portable and always charged. It is the perfect gift for those that like weather or even an uplifting, non-fiction story. The brown areas have a significant tornado risk while the yellow area from south of Tampa to Orlando has an enhanced risk. I'm highlighting this today because the run-up to Christmas may be distracting people from their usual habit of checking the weather. Renowned tech columnist Walt Mossberg has announced he will quit Facebook by the end of the year, after realising his own values now differ to those put in place by the social media giant. Mossberg, a former writer with the Wall Street Journal and current board member with the News Literacy Project, took to Twitter today to confirm his resignation to the world. “I am doing this – after being on Facebook for nearly 12 years – because my own values and the policies and actions of Facebook have diverged to the point where I’m no longer comfortable there,” he said. When he was at the Wall Street Journal I eagerly awaited his weekly column because I believed he was honest and straightforward. So, I am not surprised he came to the decision to dump Facebook. His entire announcement is here. 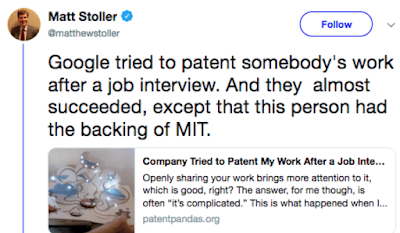 The only way these tech companies are going to reform is if they lose customers and money and, even then, it may be too late. Increasingly, Facebook, Twitter, Google, etc., are cancers on our society (scroll down past the Wright Brothers' post for examples). There was no complicated (eight boarding groups!) boarding procedure. There was unlimited leg room. And, the Wrights were served the same number of free in-flight meals you get in coach today. Apparently, Mocking Global Warming is Now "Sensitive"
I was surprised to see the following tag on my Twitter feed this morning. So, knowing this was Twitter, I clicked "view." Below, you will see the 'sensitive' material. Conclusion? Social media isn't very sociable. Wow. I figure if I spent my entire retirement funds I could probably afford to fly it from Wichita to Kansas City, one way. Enjoy. Three days ago, Boeing announced a private version of the 777 which is even larger than the 787. Wow. 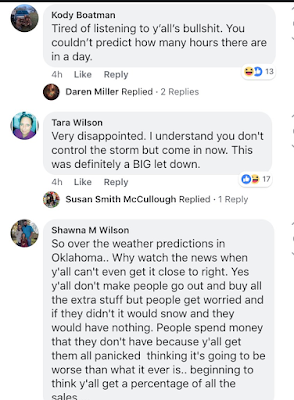 Even in 2018, there are people who dispute the fact that tornado warnings save lives. Today, I came across a story in the Springfield, Illinois, State Journal-Register pertaining to the warnings that clearly saved lives as a tornado passed near a (called-off due to the warnings) Santa Parade on December 1 in Taylorville, Illinois. I would like to congratulate the National Weather Service on a job well done as well as the officials and citizens of Taylorville for responding in the proper manner. While there was considerable damage, there was no loss of life. Attention: Storm Chasers and Anyone Interested in Weather or Storms! 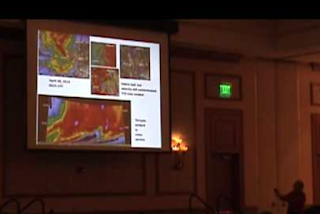 For the first time, Chasercon -- the world's largest meeting of storm chasers and meteorologists who focus on storms -- will be in Wichita this February 8 to 10th. On Sunday, 10th, there will be a seminar on "how to forecast severe storms" which will be useful beyond storm chasers. It will be valuable for emergency managers and anyone wanting to get a jump on tornadoes and extreme thunderstorms. I will be delivering the keynote speech Saturday evening (9th) as well as moderating a panel of storm chasers/law enforcement/emergency management on how to make chasing safer as well as more useful to society. Reed Timmer of AccuWeather, formerly of the Discovery Channel's Storm Chasers will be a participant. 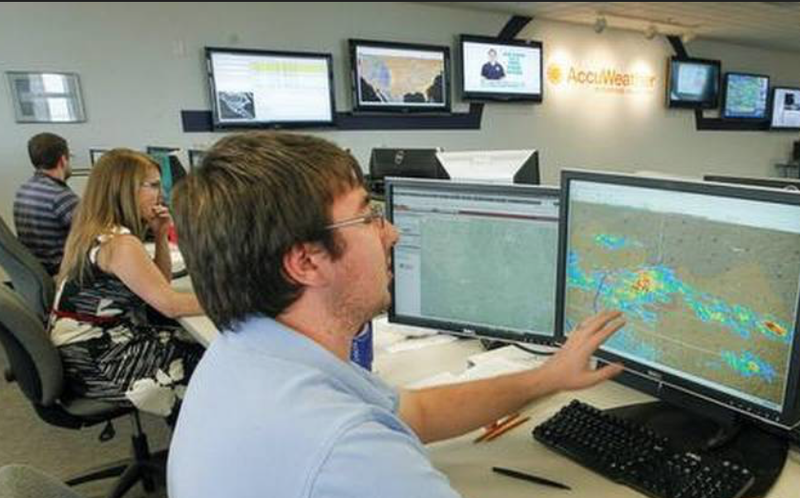 There will also be tours of AccuWeather's Extreme Weather Center in Wichita during the event. 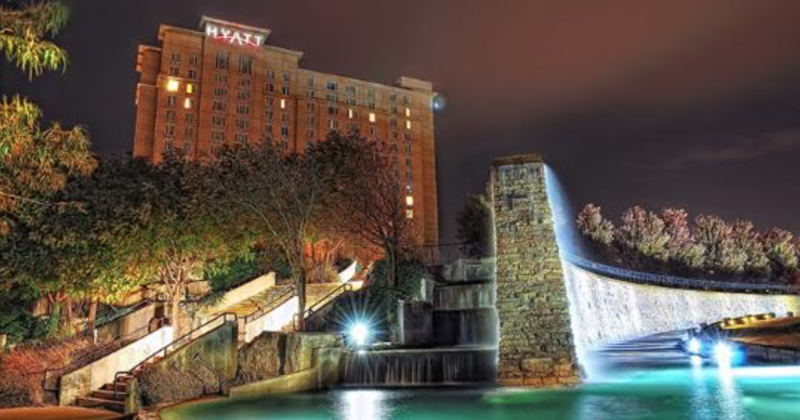 The event is being held at the Hyatt Regency Wichita (special room rates, here) which is a wonderful hotel with great food and great service (it is where I held my retirement party). Exploration Place. My granddaughters visited ten days ago and loved it. The best part? "Flying the plane." The amazing Toy Train Museum (yes, you can play with the trains!). Weather-permitting, the Sedgwick County Zoo. It has won many awards. It is just amazing for a city of our size (it is northwest of downtown). Wichita has a new, modern airport and is served by most major airlines. 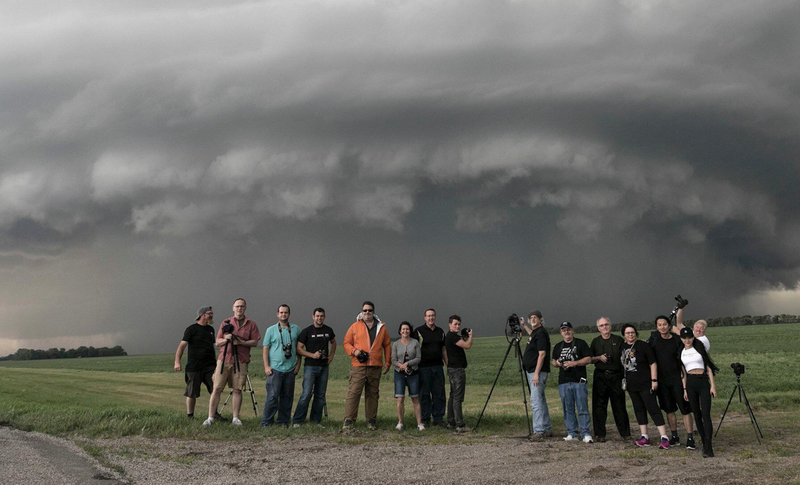 If you are interested in weather or storms: come, learn, and have a great family experience. 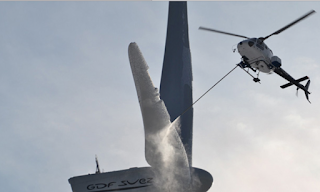 As readers of this blog know, I am not a fan of wind power as it currently stands. However, that will change if cheap storage becomes available and if we find better ways of protecting wind farms from lightning, ice, (ironically) high winds and other forms of extreme weather. The current generation of wind turbines is surprisingly delicate. There is good news with regard to wind turbines and lightning mitigation. 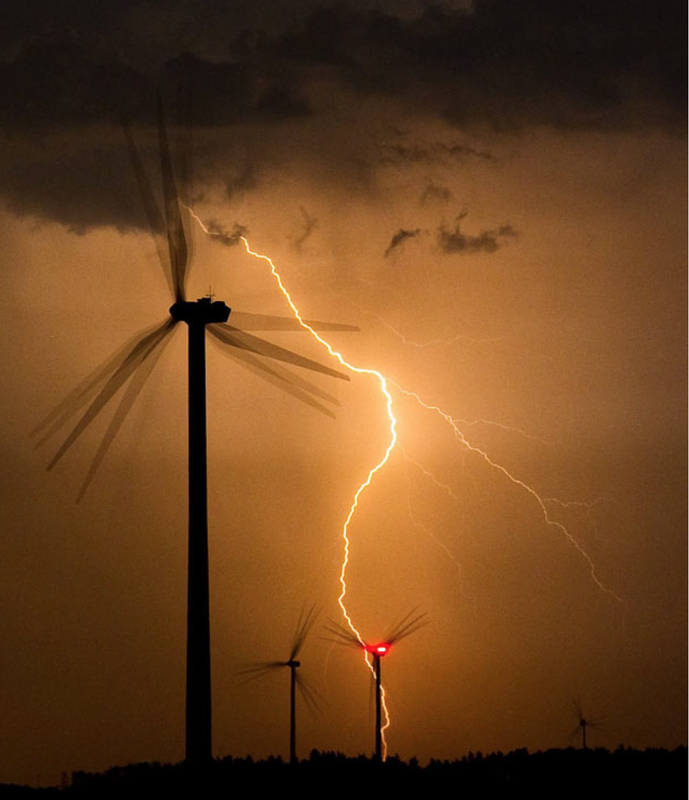 Wichita State University has developed a way to protect the turbines when they are struck. Wichita State's system for protecting wind turbines is an outgrowth research done by its National Institute for Aviation Research. After all, a turbine blade is similar to an aircraft wing or an airplane's propeller. 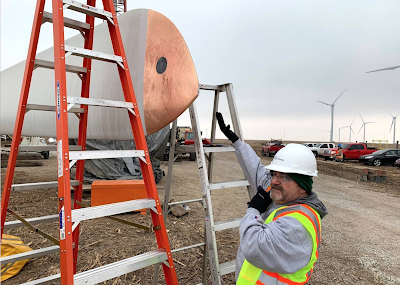 I am hopeful all of this will add up to meaningful progress in the field of wind energy so it is a useful source of reasonably-priced energy without subsidies. 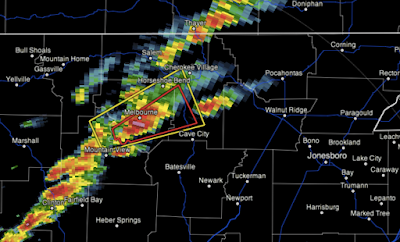 This is the story of a bad idea: probabilistic storm warnings. Under the current storm warning system, you are either in a storm warning or not. For example, in the illustration below, the red area is a tornado warning which is nested in a yellow severe thunderstorm warning (large hail or damaging winds). So, if you are in the tornado warning, your weather radio or tornado siren goes off, or the TV cuts in to let you know. You immediately go to shelter. That's it; that's all a member of the public has to know. Unfortunately, the meteorological research community has been in love with the idea of probabilistic weather forecasts ("20% chance of rain") for decades and now wants to extend that concept into tornado and other storm warnings. In their minds, probabilities of flash floods and tornadoes (to name two) are "more scientific" than "deterministic" (yes or no) warnings. Instead of "Take Cover!" (or not) as with the current system, your local television station will show you a graphic similar to the above that will update as often as every one minute. Instead of, "Go to the basement!," you will learn you have a 70% chance of tornado in the next 15 minutes, a 40% of a tornado in the next 30 minutes and a 10% chance of a tornado in the next 40 minutes. And, the probabilities you are given will change at least every five minutes and, perhaps, as often as every one minute. Really. This is a terrible idea that will cost lives. 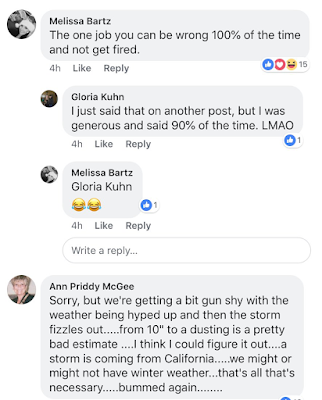 Surveys (here, among many others) show the public does not adequately understand what a "20% chance of rain" officially means (other than 80% is more than 20%). 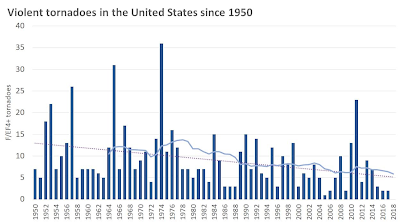 Those probabilities (and it rains far more often than a tornado occurs) have been around for a half-century. If we have not been able to educate the public over a half-century as to the meaning of probability of precipitation, there is virtually no hope of educating them to learn that a 10% chance of a tornado in 30 minutes is actually high. Unquestionably, you should go to the basement or take other shelter if there is a 40% chance (which is very high) of a tornado in the next 20 minutes. 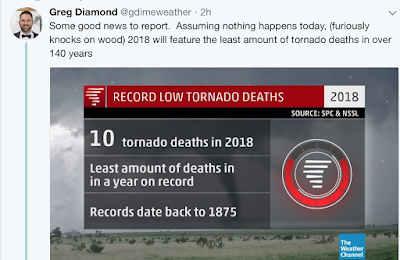 I confidently forecast this 40% number will cause mass confusion (deadly when dealing with life-threatening weather) and far fewer will take shelter than do now -- and, that deaths and injuries will almost certainly rise. With the colors and numerical probabilities constantly changing, they will be nearly impossible to convey on television and online in a meaningful way. In the above illustration, part of the area in the tornado's path is green. Green is a color associated with safety, not danger. Commercial radio and weather radio will not be able to convey this type of warning at all. What do you do with tornado sirens? These probabilities will be uncalibrated. Because tornadoes are so rare at a given location, there will be no way to know if a 55% chance of a tornado is actually meaningful or if it is just a number. 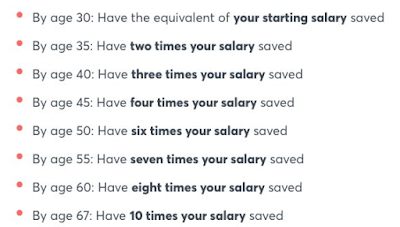 I first heard about this concept at a meeting in Norman, Oklahoma, five years ago this month. I, and others, raised these concerns then and since but those concerns have fallen on deaf ears. To give a simple example, I've mentioned that green is not a color that should be used in tornado warnings. As recently as yesterday (see above illustration), it still was. 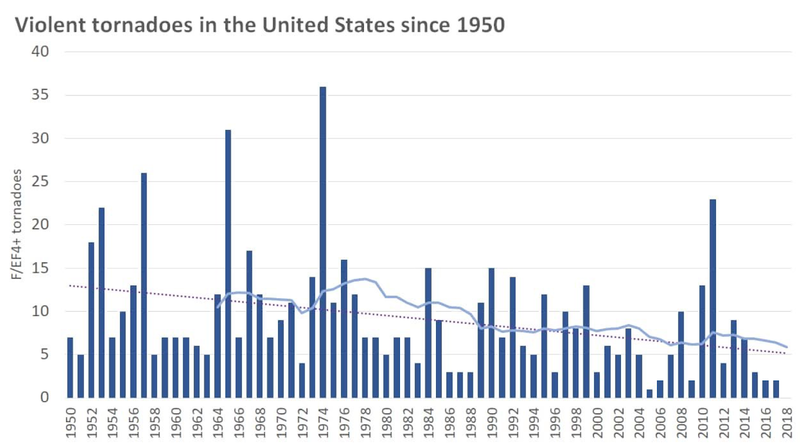 What makes this even worse is that the existing tornado warnings continue to decline in accuracy -- a topic we have discussed several times on this blog; if you want a recent example of a missed warning of a major tornado, go here. 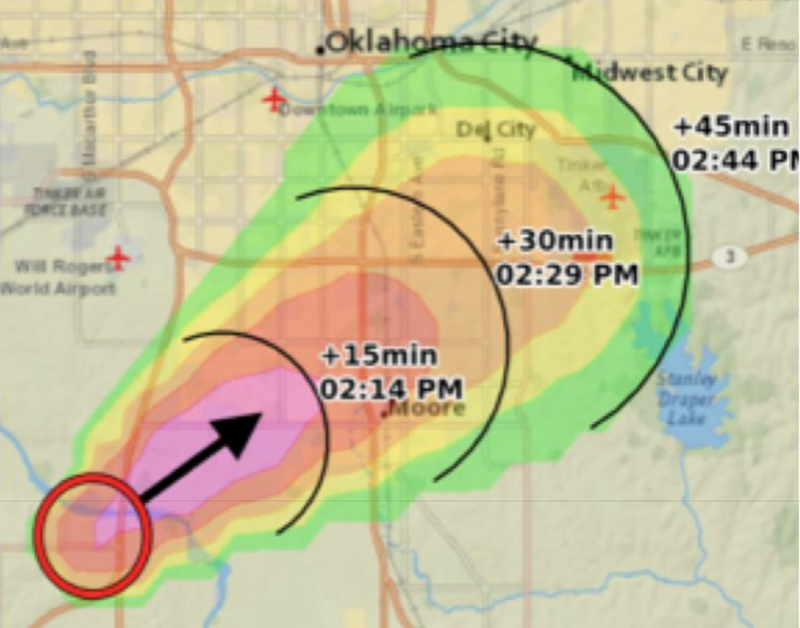 Before we make any more changes to the warning system, we need to arrest the problems that have caused existing tornado warnings to be less accurate. The tornado warning system has been a magnificent scientific accomplishment worthy of a Nobel Prize. 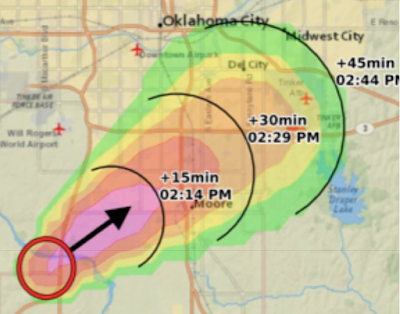 The idea to create probabilistic tornado warnings needs to go away and the excellent brainpower of those involved should be used to fix and improve the existing warning system. Addition: I have been asked to provide evidence that tornado warnings across the United States are now less accurate than ten years ago. I've written about it so many times that I didn't think I needed to provide a link and I apologize. Go here and you can read my thoughts and those of Jason Samenow of the Capital Weather Gang on this important topic. I came across this a few hours ago. 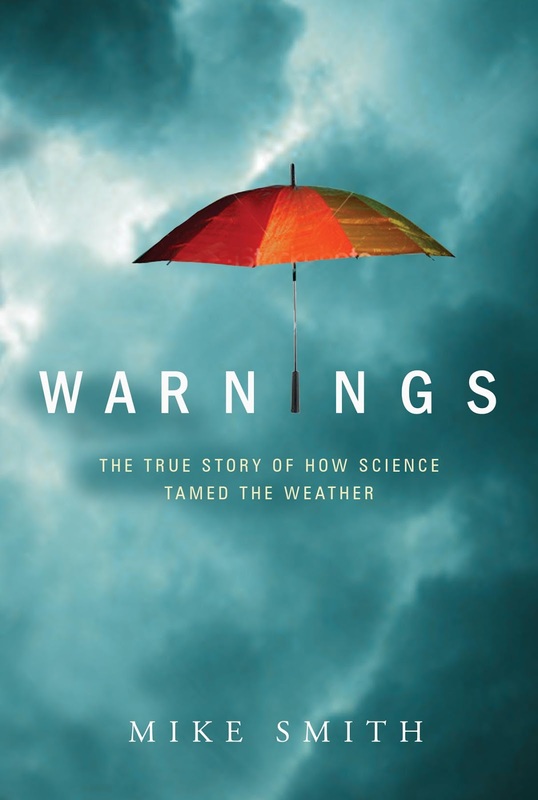 Warnings makes a great Christmas gift for anyone interested in weather or science. Click on the red link to see it at Amazon. Getting back into their limos. 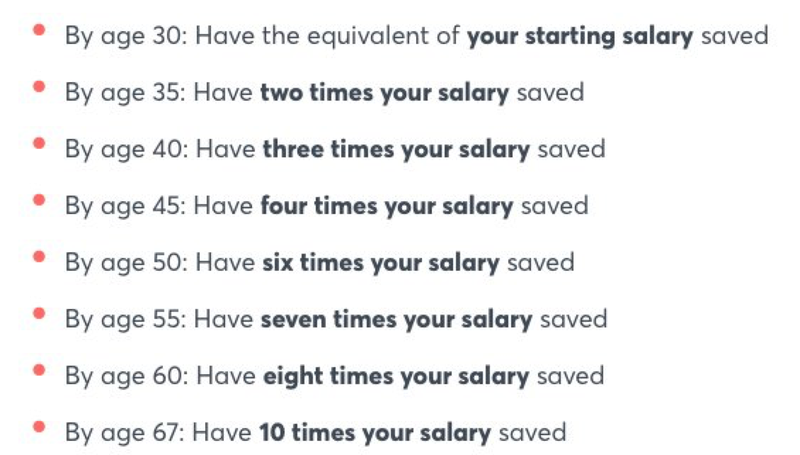 Whole thing could be done in 45 minutes, tops. Then, publish an online list of the winners while the celebrities are driven to their respective parties. No more nearly three-hour broadcasts. No more celebrities having to pretend to be interested while the "best technical awards" video plays. No more closeups of four "it's an honor to be nominated" losers while the winner isn't even in attendance. What Is It Like to File Insurance Claims After a Catastrophe? A terrific article is here about the experience of filing claims after California's Camp Fire. I would have been even more critical of the insurance company than the author. At AccuWeather Enterprise Solutions, because we were dealing with mission critical issues, we had (and I believe still have) human beings answering the phones 24/7 without automation. The customers loved it. Insurance claims people need to lose the automation when dealing with people who have lost everything. The latest proof of that contention is here via British investigators. I requested deletion of my Facebook page in April but I seriously doubt Facebook deleted it or any other users'. Catholics believe, of course, that Jesus led a sinless life. Catholics also believe that his earthly mother, Mary, also lead a sinless life. Yesterday at the Mass for the Immaculate Conception, Fr. Josh Evans commented on the above by saying, "Can you imagine poor Joseph? Everything was always his fault!" The New York Post has a heartbreaking story about the large, and growing, Ebola outbreak in the Congo which threatens to break out of that nation. 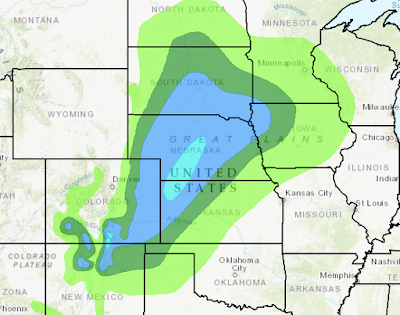 This past Sunday, the computer models were unanimously forecasting heavy snow would fall over southern Kansas and northern Oklahoma beginning this afternoon and continuing into Saturday night. The Governor of Oklahoma (prematurely, in my opinion) declared an official "state of emergency." Food flew off store shelves. This is a historic bust and I want to spend a moment discussing what happened and why. It is has been a very long time since the computer models, in unison, were so very wrong. I hope meteorologists at the National Severe Storms Laboratory, the University of Oklahoma or some other research institution in the area affected by the bust will take hard look at what went wrong and use it to create more robust models. Meteorologists have a bad habit of presenting scientific papers about successes but often do not focus on the busts. This one demands attention. Next is the role of television consultants and news directors. We have a station here in Wichita that forecasts weather conditions and -- down to the single degree -- temperatures out to ten days. 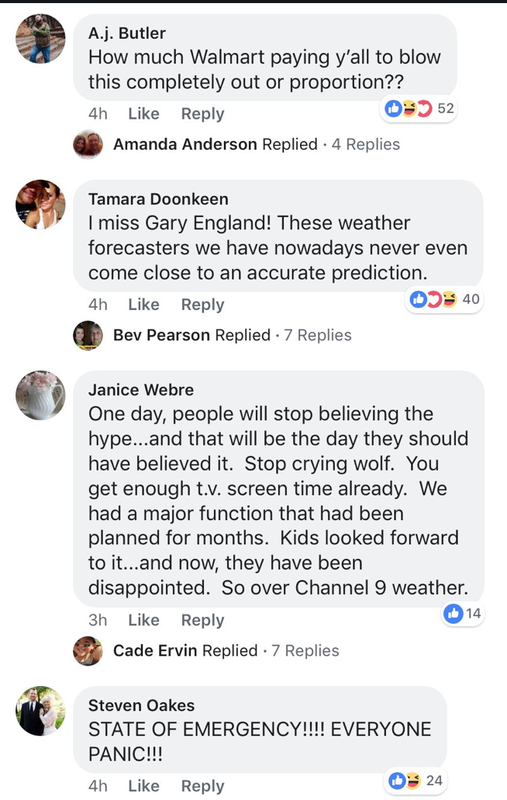 We have no reliable skill with ten day forecasts. But, because meteorologists put them on the air, they are expected to be dependable and of good quality. 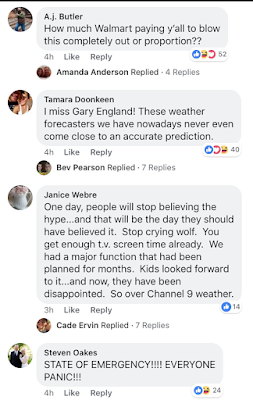 If it were up to me, the forecasts for the public would go out no more than five days. 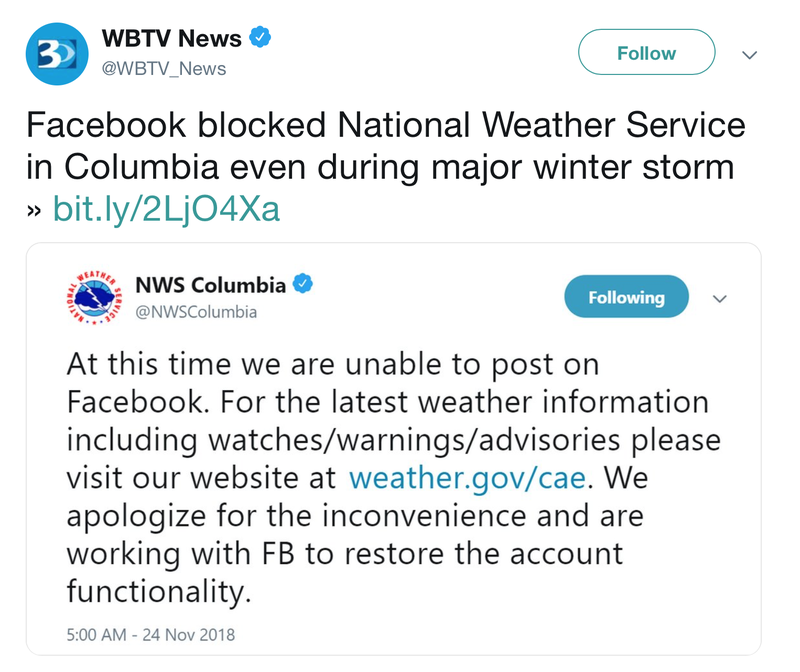 In the central United States, I wouldn't try to forecast winter storms for the public beyond 3.5 days (commercial meteorologists would continue to make five-day winter storm forecasts for highway departments, utilities and others that need more notice). Finally, there is the role of the public. Meteorologists don't recommend running to the grocery store for bread, milk and eggs five days before the onset of a storm (the "french toast warning" as Dave Barry puts it). 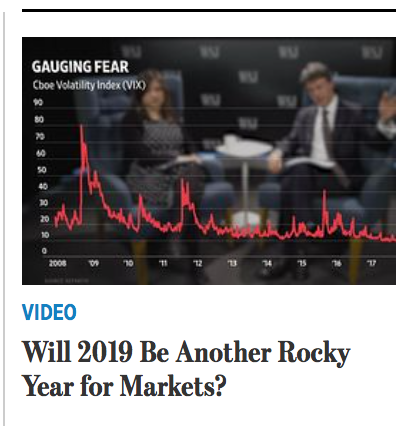 Some get far too emotional about these forecasts. From an OKC TV meteorologists' Facebook. This is crazy talk. 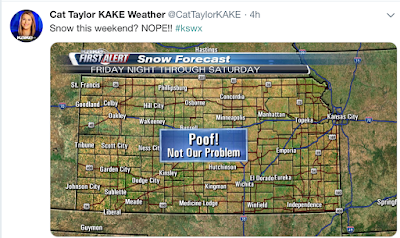 Just ten days ago, meteorologists correctly forecast the blizzard that occurred the Sunday after Thanksgiving. This forecast saved innumerable lives and allowed people -- if they chose -- to change their plans and prevent a major inconvenience. This past Sunday, meteorologists did an incredible job with an out-of-season tornado outbreak in Illinois. So, yes, this was a huge bust in Kansas and Oklahoma. But, the level of venom in the above tweets is too much. 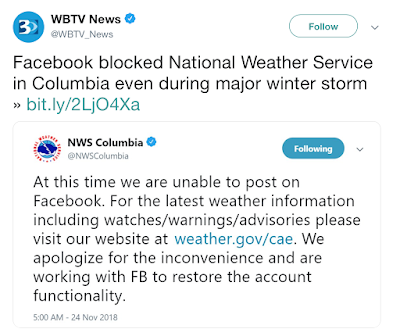 Meteorologists don't, and won't, get every storm warning correct. 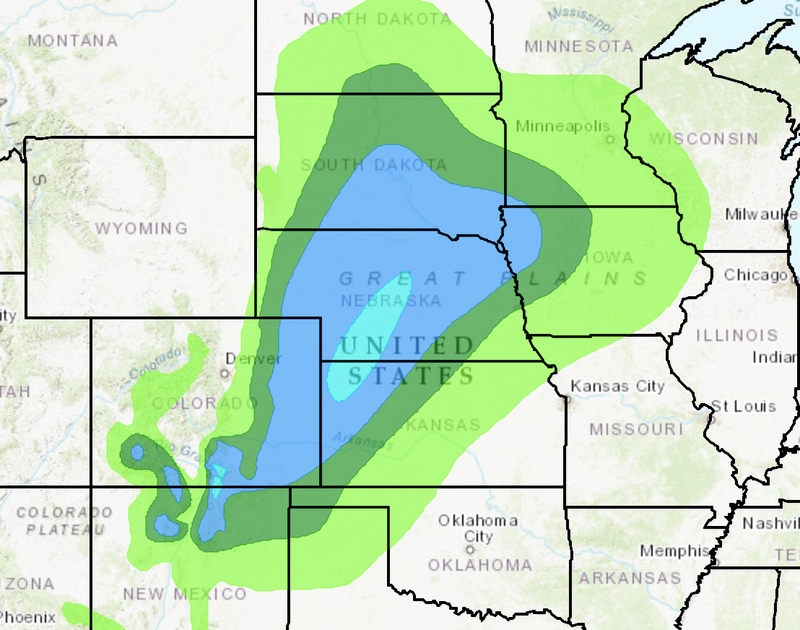 My advice: Unless you need forecasts for commercial purposes, don't worry about Great Plains winter storms more than about three days into the future (for example if heavy snow is forecast for Friday, don't worry about it until about Tuesday evening). Addition: The Capital Weather Gang has written a similar, and very insightful, piece on the same topic. It is here and I recommend it. There is one other thing I should have added to my piece above. 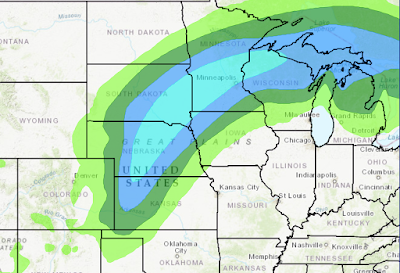 And, that is the some storms are much more "forecastable" than others. 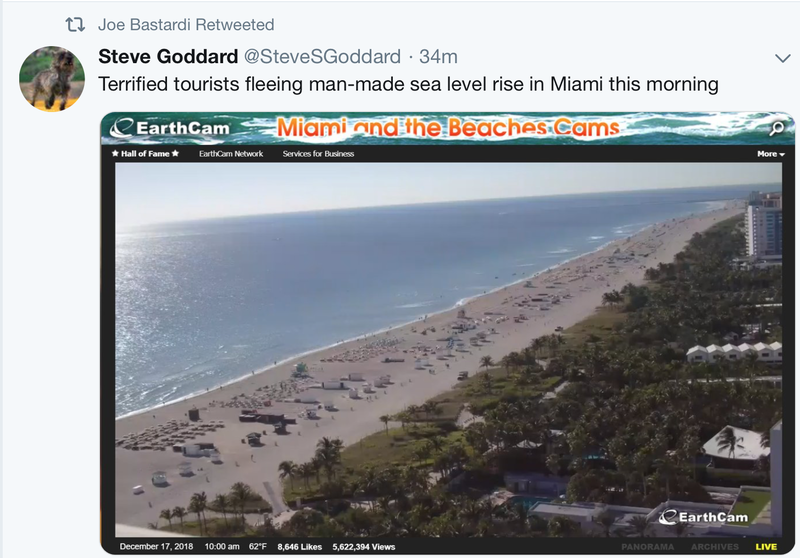 This fact has nothing to do with climate change or anything else. Meteorologists were lamenting this fact in the 1970's and, probably, long before.